Many times it is seen that all planets/graha in the person birth kundli/Horoscope are good, however there is no progress in the life, no profit in money, disturbance remains in the life and no interest in doing any work. The reason of this may be any planet/graha defect in our Horoscope. Here, we are mentioning the defects caused by various planets in the Horoscope, so that you can live a happy life by doing worship of those planets accordingly. 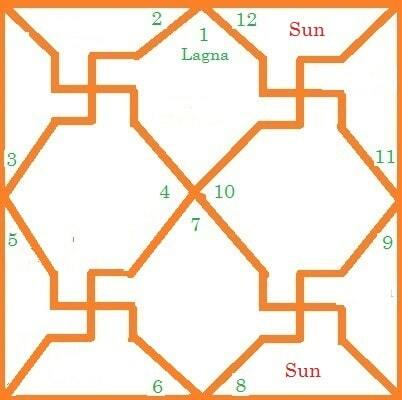 If sun is situated in eighth or twelfth house from lagna (i.e. 1st house) in Horoscope as shown in below figure then Goddess's defect is made. Any votive is left incomplete, please complete it. Kindly go to the temple of goddess/devi and offer Coconut and offerings. Also, do apologize for your mistake. Remedy: Feed food to Brahmin on moonless day. Please donate milk, fruits and sweets etc at least five moonless days. Offspring growth and there will be peace in the family. Remedy: Please offer coconut and clothes on Mother Goddess. Do Durga Chalisa. Doing this, your incomplete work will get completed with the mercy of Devi and wealth will increase. Remedy: Please do bath in Yamuna River on 5 Saturdays or 5 Sundays. Doing this, your virtue will increase and get God's grace. Remedy: Please do worship of Shitala devi, feed bread to dogs and watering in Jndi tree. Doing this, you will be free from your troubles and get peace. Remedy: Phantom defect is a very bad that stops the growth of offspring. Discord happens in the home. For this, please go to Haridwar, Gayaa ji in India for having phantom consoles. Doing this, peace will remains in the family. Remedy: 9 planets are owner of our body. If they are angry then our body hurts and mind cannot take the right decision. For this, please do worship of 9 planets/graha. Remedy: There are 51 Area God, which protects all areas. If you face any problem in any work or area then please do their worship. Do worship with the help of any learned priest. So that, your work will be complete after removing their defects. Remedy: If you do not worship your family God or Goddess in marriage or celebration time then they become angry. And then, they do discord in the family. So, please always do worship of your family God and Goddess. Remedy: In demoniac defect, someone has done something wrong with you or your leg has fallen on wrong place. For this, please do worship of Hanuman ji, read Hanuman Chalisa and visit Hanuman ji Temple. Remedy: You did not complete any votive. For this, please offer coconut and clothes on Mother Goddess. Remedy: Please do chant of Gayatri Mantra and yagya, so that your mind can take right decision. Gayatri Mantra: Om bhur bhuvah svah tat savitur vareniyam bhargo devasya dhimahi dhiyo yo nah prachodayat. Remedy: Any unmarried ancestor/pitr is sad. For this, please do Brahmin food on their Memorial Date or on moonless day and feed bait to cow. To get rid of all these planets defects and for making your life happy, person should follow his/her religion rules, respect all and do God worship. Copyright © 2012-2019 Shrijijyotish.com. All Rights Reserved.